When your institution has followed the guide for setting up Peergrade with Canvas teachers are able to use Peergrade from their courses. When you're inside your class in Canvas you should see a tab in the sidebar called Peergrade. The first time you click on it you'll see a button that says Connect with Peergrade. 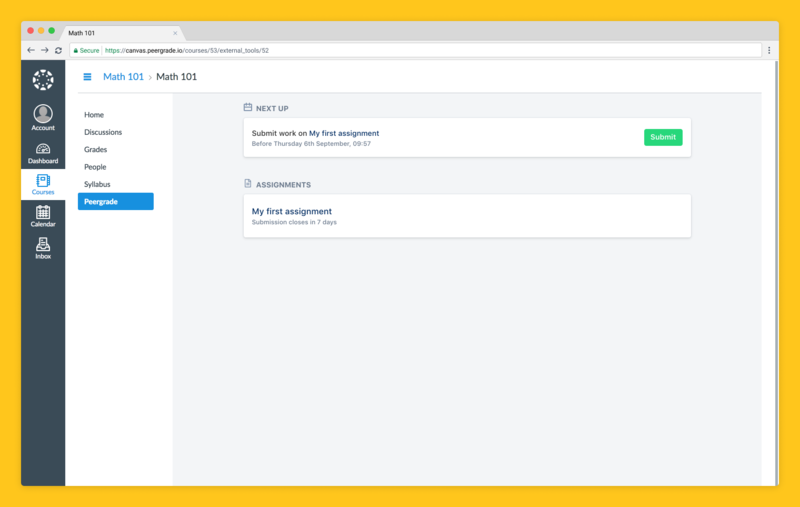 When the button is clicked your course will automatically be set up with Peergrade and you will be able to create your first Peergrade assignment. 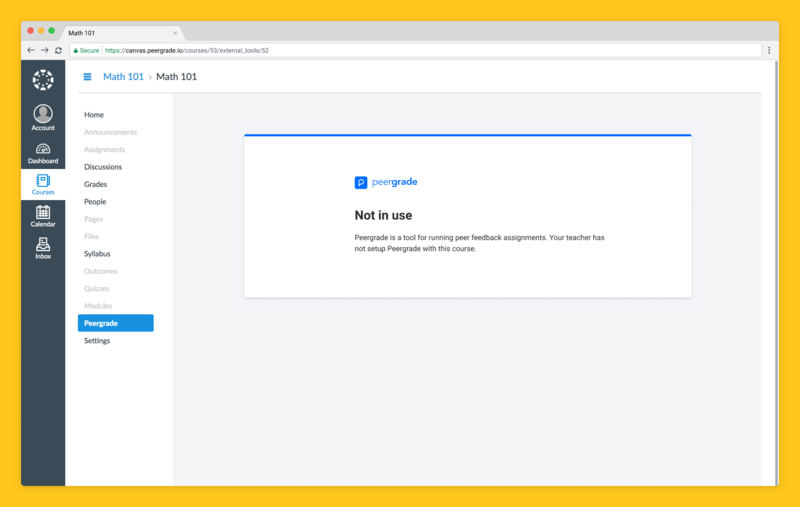 When you have connected your course with Peergrade and made your first assignment students can access it by going to your course and click on Peergrade in their sidebar navigation. All of their Peergrade activities will be available here. What if I haven't connected to Peergrade? If you have not connected your course to Peergrade and students click on the Peergrade tab in your course all they will see is a screen telling them that Peergrade is not in use. 💡 Tip: If you want to hide the Peergrade menu item for students you can go to Settings > Navigation and drag Peergrade to the list of hidden items for students. We send out email notifications to you and your students. 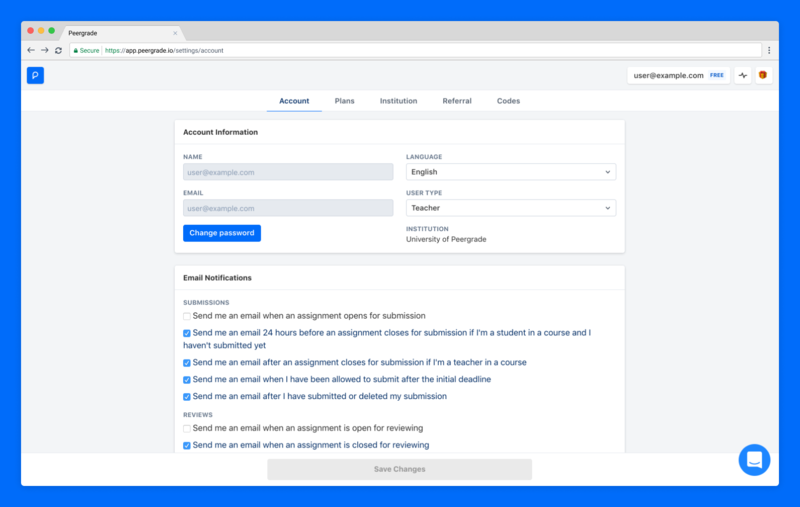 Course specific email notifications can be accessed by navigating to the Peergrade tab in the sidebar, click on Class settings and scroll to the Email settings section. ✏️ Note: When you or your students receive emails with links to Peergrade they will open Peergrade outside of the Canvas environment. 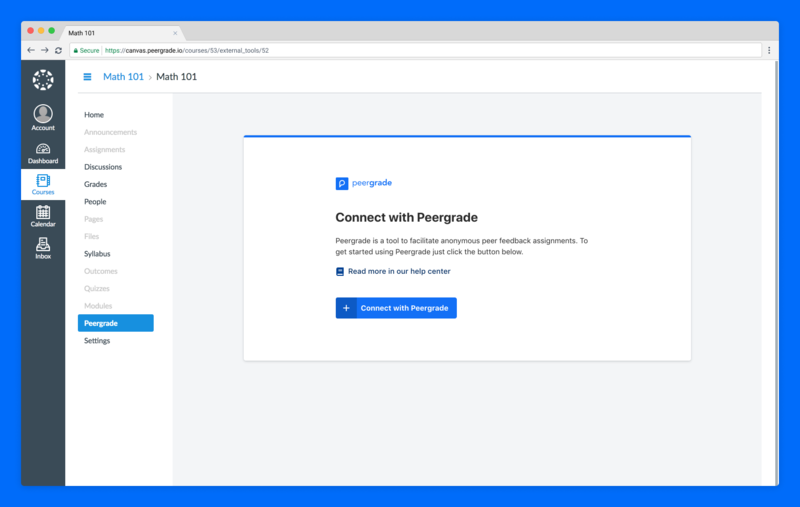 When you connect Peergrade with your course in Canvas we add students from your Canvas class to Peergrade automatically. If students are added to your Canvas course after they have been imported to Peergrade they will have to click on Peergrade in their sidebar before they will appear in your list of students on the Participants tab. If you wish to access your Peergrade account settings to change the language or your personal email settings you will need to open a new tab or window and go to https://app.peergrade.io/settings/account.